The delicate onion-like flavor of chives has been a prized cooking ingredient for thousands of years. 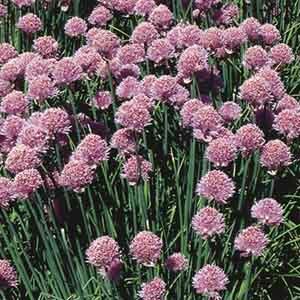 Chives are native to Asia but adaptable to most parts of the world. The grassy, tubular foliage and unique, ball-like flowers are a fun addition to the perennial garden. Foliage and flowers are edible and rich in vitamin C! Perfectly sized for rock gardens and border fronts. Excellent cut flowers for fresh or dried arrangements. Superb for adding flavor to soups, stews and casseroles. Wash fruits, vegetables and herbs thoroughly before eating. Very easy to grow in virtually any location. Plant in a reliably sunny spot. Best in fertile, well-drained soil. Tolerates drought, but looks best with regular watering. Harvest foliage as needed.